Press Windows Key + R (or Goto Start-> Run). 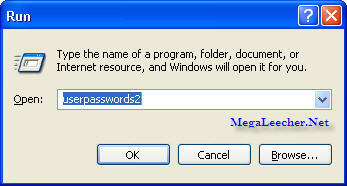 Type control userpasswords2 and press enter in RUN dialog box. Click the username you want to autologin and uncheck the box “Users must enter a username and password to use this computer”. UPDATE: You can also use the AutoLogin utility provided by Sysinternals (now owned by Microsoft) to make the necessary changes to the registry. He gave two different instructions...one for Vista, and one for XP. The userpasswords2 is for XP. The one for Vista is above it (netplwiz) and it DOES work. Tried copy and pasting userpasswords2 into run command. Didn't work could not be found. I mistakenly made the userpasswords2 bold and left control as it is from the full command "control userpasswords2", resulting in trick not working for users, thanks for pointing out. This does not work. I unchecked the "user must enter a username and password..." box. Now when I boot, it says invalid password and an extra log-in icon is there. All this did was make the log-in problem worse. im making a jukebox and i am using novell client for windows to connect to my netware server and now i don't have to enter any passwords when the system boots! hey,,it's working in windows 7 too..
for Win XP sp3 type in Run [control userpasswords2], it's worked well,don't miss the space between control and userpasswords2 . 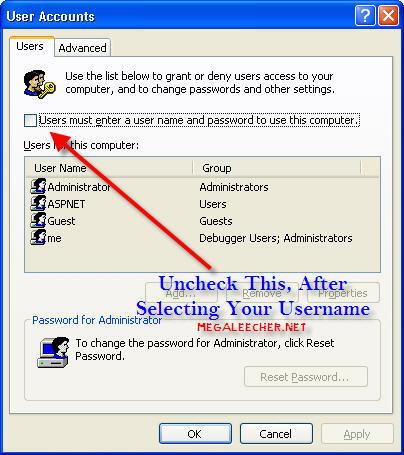 for xp3 use " control userpasswords2 "
I want to login as a administator or get admininistrator rights in user account without change or remove admininistrator password. "To continue type user name and password of administrator"